Search Engine Optimization (SEO) can seem like voodoo. The goal of a search engine is to provide results that will be most relevant and useful to users. Search engines use complex algorithms that take into account hundreds of different elements to determine the most useful results. Google does not disclose the details of their algorithms, but through research and testing, we know what factors are really important and which are not. Our goal at ZAG FIRST is to provide tremendous value to our clients at a much lower price point that typical marketing agencies. The team at ZAG FIRST has been doing Search Engine Optimization (SEO) work since the late 90s. We have seen the rise of Google and have had a courtside seat as their algorithms have evolved. From our standpoint, the key is to focus on the top 5-7 factors that impact search results. By focusing on the factors that matter that most, we can provide more value at a fraction of the cost of other companies. We use the same tools, reporting, and dashboards as giant agencies – we just do not have layers of management that you have to pay for. We are focused on small and medium-sized business and we understand what really matters to them. Why is it important to get on the first page of Google Search Results? Because the first page of search results gets over 91% of all clicks. 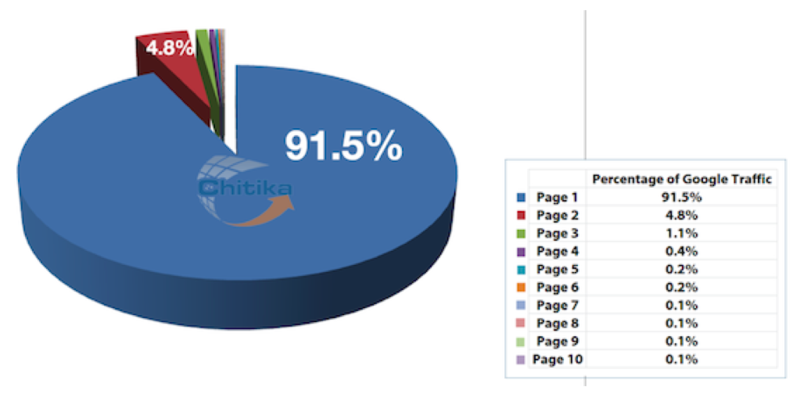 The entire second page gets less than 5% of clicks and page 3 only gets 1% of clicks. Organic vs. Paid Search – What is the difference? There are two primary types of search results – Organic and Paid. Organic Search – Organic search results are listings on search engine results pages that appear because of their relevance to the search terms. The order of organic search results is displayed based on what the search engine’s algorithms determine is the best answer to any query. The best answer is the first results, the second best answer is the second result, etc. Paid Search – Paid search results are advertisements that are paid for by companies to be displayed for certain search terms. Any search result that is a paid result is clearly marked with the word “AD” (short for advertisement) and can be at the top, bottom or right of the organic search results. Where a paid ad ends up is primarily based upon the amount advertisers bid for specific keywords (but the relevance of the ad also plays a significant role in placement). How do you get on the first page of Google Search Results? The process to increase your organic search rankings takes time (several months) and effort (many hours per month) to make a significant impact. It involves a process of creating new optimized pages and optimizing existing pages to target specific keywords. The process to set up paid search results involves uploading your keyword lists, developing text ads and setting a budget for each targeted group of terms. Once you start the campaign, the key is to continually monitor and test different text ads in order to increase the quality and decrease the cost of driving qualified leads to your site. This process is primarily driven by math and analysis. Once the campaign starts, we make changes purely based on what changes provide the best results. How do you pick someone to help you with your Search Engine Optimization (SEO)? This is the million dollar question. You can pick a large national agency and spend tens of thousands of dollars a month – and they will do a good job for you. ZAG FIRST is focused on small and mid-sized companies – we focus on making a big impact with minimal cost. Contact us to see what we are all about and how we can drive results for your company.